Structure of the methoxide anion. Although alkali metal alkoxides are not salts and adopt complex structures, they behave chemically as sources of RO−. An alkoxide is the conjugate base of an alcohol and therefore consists of an organic group bonded to a negatively charged oxygen atom. They are written as RO−, where R is the organic substituent. Alkoxides are strong bases and, when R is not bulky, good nucleophiles and good ligands. Alkoxides, although generally not stable in protic solvents such as water, occur widely as intermediates in various reactions, including the Williamson ether synthesis. Transition metal alkoxides are widely used for coatings and as catalysts. Enolates are unsaturated alkoxides derived by deprotonation of a C-H bond adjacent to a ketone or aldehyde. The nucleophilic center for simple alkoxides is located on the oxygen, whereas the nucleophilic site on enolates is delocalized onto both carbon and oxygen sites. Phenoxides are close relatives of the alkoxides, in which the alkyl group is replaced by a derivative of benzene. Phenol is more acidic than a typical alcohol; thus, phenoxides are correspondingly less basic and less nucleophilic than alkoxides. They are, however, often easier to handle, and yield derivatives that are more crystalline than those of the alkoxides. Alkali metal alkoxides are often oligomeric or polymeric compounds, especially when the R group is small (Me, Et). The alkoxide anion is a good bridging ligand, thus many alkoxides feature M2O or M3O linkages. In solution, the alkali metal derivatives exhibit strong ion-pairing, as expected for the alkali metal derivative of a strongly basic anion. Structure of the Li4(OBu-t)4(thf)3 cluster, highlighting the tendency of alkoxides to aggregated and bind ether ligands. Color code: dark gray = C, violet = Li, red = O, light gray = H.
Other alkali metals can be used in place of sodium, and most alcohols can be used in place of methanol. Another similar reaction occurs when an alcohol is reacted with a metal hydride such as NaH. The metal hydride removes the hydrogen atom from the hydroxyl group and forms a negatively charged alkoxide ion. Copper(I) t-butoxide adopts a square structure, a consequence of the preference of Cu(I) for linear coordination geometry. Many alkoxides can be prepared by anodic dissolution of the corresponding metals in water-free alcohols in the presence of electroconductive additive. The metals may be Co, Ga, Ge, Hf, Fe, Ni, Nb, Mo, La, Re, Sc, Si, Ti, Ta, W, Y, Zr, etc. The conductive additive may be lithium chloride, quaternary ammonium halide, or other. Some examples of metal alkoxides obtained by this technique: Ti(OCH(CH3)2)4, Nb2(OCH3)10, Ta2(OCH3)10, [MoO(OCH3)4]2, Re2O3(OCH3)6, Re4O6(OCH3)12, and Re4O6(OCH(CH3)2)10. The alkoxide ion can react with a primary alkyl halide in an SN2 reaction to form a methyl ether. By controlling the stoichiometry and steric properties of the alkoxide, such reactions can be arrested leading to metal-oxy-alkoxides, which usually are oligonuclear complexes. Other alcohols can be employed in place of water. In this way one alkoxide can be converted to another, and the process is properly referred to as alcoholysis (unfortunately, there is an issue of terminology confusion with transesterification, a different process - see below). The position of the equilibrium can be controlled by the acidity of the alcohol; for example phenols typically react with alkoxides to release alcohols, giving the corresponding phenoxide. More simply, the alcoholysis can be controlled by selectively evaporating the more volatile component. In this way, ethoxides can be converted to butoxides, since ethanol (b.p. 78 °C) is more volatile than butanol (b.p. 118 °C). In the transesterification process, metal alkoxides react with esters to bring about an exchange of alkyl groups between metal alkoxide and ester. With the metal alkoxide complex in focus, the result is the same as for alcoholysis, namely the replacement of alkoxide ligands, but at the same time the alkyl groups of the ester are changed, which can also be the primary goal of the reaction. Sodium methoxide, for example, is commonly used for this purpose, a reaction that is relevant to the production of "bio-diesel". Characteristically, transition metal alkoxides are polynuclear, that is they contain more than one metal. Alkoxides are sterically undemanding and highly basic ligands that tend to bridge metals. Upon the isomorphic substitution of metal atoms close in properties crystalline complexes of variable composition are formed. The metal ratio in such compounds can vary over a broad range. For instance, the substitution of molybdenum and tungsten for rhenium in the complexes Re4O6−y(OCH3)12+y allowed one to obtain complexes Re4−xMoxO6−y(OCH3)12+y in the range 0 ≤ x ≤ 2.82 and Re4−xWxO6−y(OCH3)12+y in the range 0 ≤ x ≤ 2. Many metal alkoxides thermally decompose in the range ~100–300 °C. Depending on process conditions, this thermolysis can afford nanosized powders of oxide or metallic phases. This approach is a basis of processes of fabrication of functional materials intended for aircraft, space, electronic fields, and chemical industry: individual oxides, their solid solutions, complex oxides, powders of metals and alloys active towards sintering. Decomposition of mixtures of mono- and heterometallic alkoxide derivatives has also been examined. This method represents a prospective approach possessing an advantage of capability of obtaining functional materials with increased phase and chemical homogeneity and controllable grain size (including the preparation of nanosized materials) at relatively low temperature (less than 500−900 °C) as compared with the conventional techniques. The structure of tetranuclear rhenium oxomethoxide (hydrogen atoms omitted for the sake of simplicity). ^ Boyd, Robert Neilson; Morrison, Robert Thornton (1992). Organic Chemistry (6th ed.). Englewood Cliffs, N.J.: Prentice Hall. pp. 241–242. ISBN 9780136436690. ^ a b Bradley, Don C.; Mehrotra, Ram C.; Rothwell, Ian P.; Singh, A. (2001). Alkoxo and Aryloxo Derivatives of Metals. San Diego: Academic Press. ISBN 978-0-08-048832-5. ^ Turova, Nataliya Y.; Turevskaya, Evgeniya P.; Kessler, Vadim G.; Yanovskaya, Maria I. (2002). The Chemistry of Metal Alkoxides. Dordrecht: Kluwer Academic Publishers. ISBN 9780792375210. ^ Unkelbach, Christian; O'Shea, Donal F.; Strohmann, Carsten (2014). 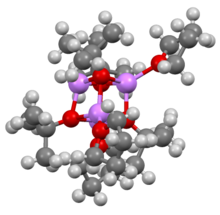 "Insights into the Metalation of Benzene and Toluene by Schlosser's Base: A Superbasic Cluster Comprising PhK, PhLi, and tBuOLi". Angew. Chem. Int. Ed. 53 (2): 553–556. doi:10.1002/anie.201306884. ^ Hanaor, Dorian A. H.; Chironi, Ilkay; Karatchevtseva, Inna; Triani, Gerry; Sorrell, Charles C. (2012). "Single and Mixed Phase TiO2 Powders Prepared by Excess Hydrolysis of Titanium Alkoxide". Advances in Applied Ceramics. 111 (3): 149–158. arXiv:1410.8255. doi:10.1179/1743676111Y.0000000059. ^ Shcheglov, P. A.; Drobot, D. V. (2005). "Rhenium Alkoxides". Russian Chemical Bulletin. 54 (10): 2247–2258. doi:10.1007/s11172-006-0106-5. Turova, Nataliya Y. (2004). "Metal oxoalkoxides. Synthesis, properties and structures". Russian Chemical Reviews. 73 (11): 1041–1064. Bibcode:2004RuCRv..73.1041T. doi:10.1070/RC2004v073n11ABEH000855.